I’m kind of excited fall is falling…it means my favorite Charlie Brown cartoon is coming soon! And I decided to create my own “Great Pumpkin” in today’s video. My apologies if it seems early to be making halloween cards…I have a huge backlog of stamps (apparently I did a LOT of shopping while sitting in hotels during this summer!) so I’m getting on top of it quick! For the scene in this video, I used the techniques in THIS video – masking tapes and my MISTI. 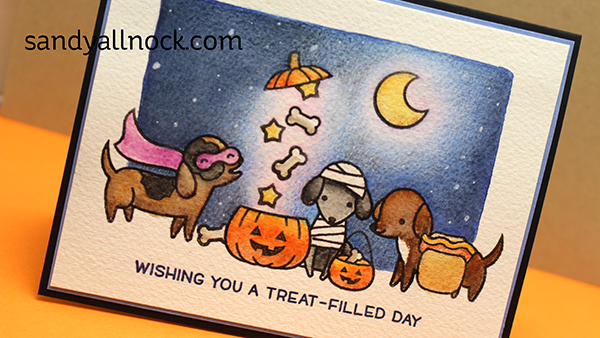 For the little mummy dog, I forgot to add his body costume, so I just drew in lines from the stamp set! Watch the video below or click HERE to see it in HD on YouTube. These little pups are so cute, and I thought I’d try dressing them up for Christmas too by combining with other Lawn Fawn sets – how darling is this!?!? Stamps used to create this scene…..Dogs: Happy Howloween and extra flying dog is from Critters at the Dog Park; Hats: Baaah Humbug and Toboggan Together; Trees: Critters in the Forest; Sentiment: Winter Scripty Sayings. I’m just now catching up on some of my blog updates from you so this is a bit late, but I LOVE these cards. So adorable and so fun to hear your tips about watercoloring (since I’m particularly challenged in that department). I just bought these stamps and can’t wait to use them. I love how you do your backgrounds. So fun to watch you make your recent Dog Pumpkin. Thank you for sharing all your wonderful video’s. Oh my gosh how cute is this card. I love it and your great. Thanks for sharing. These are both great cards Sandy. As always, I learned a couple new tips today from this video. Might just try this one tonight. TFS! Well you enabled me yet again. My LSS had this set along with my saved Crazy Dogs so it was a must have. Plus the numerous ways this set can be used is limitless especially since I make cards for our local animal shelter. Hi Sandy,both cards came out with beautiful night sky background. I’m one of those patience practice people.I get so rushed to finish…then blobbed at the end.Must practice more patience. BLESSED Day. Love them both. Missed seeing everything while away for 2 weeks. Playing catch up, gotta a lot of videos to watch. So awesome. 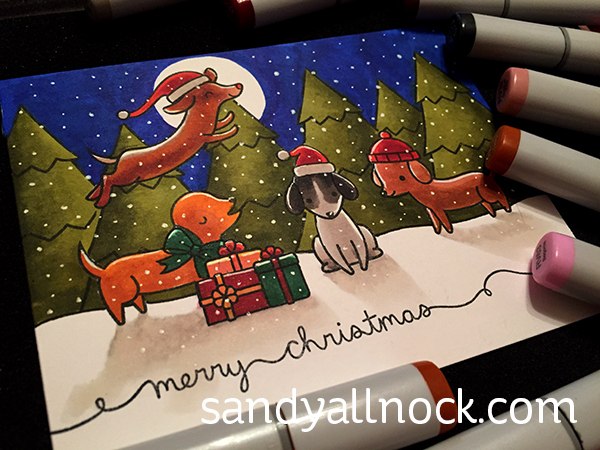 Sandy, you make my heart happy to watch you coloring … thank you! I’m looking all over for the name of the pencil sharpener you mentioned and don’t see it. Can you tell me??? Sorry! Added it to the list now. The hot dog costume just makes me smile! Thanks for some great cards! Love the card! You have inspired me to get out my colored pencils more. And, I need to get that stamp set. So cute! Super cute! I dream of coloring as well as you. I am one of those not so patient colorers you were talking about. Really cute. I started my Halloween and Thanksgiving cards weeks ago. 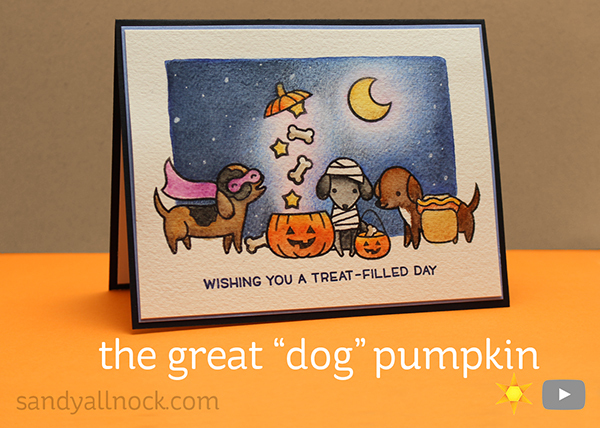 It’s a busy time of year for card crafters and I really like fall themed cards. TFS all your expertise. Totally spaced adding it to the list of supplies – it’s there now. Soooo cute. When you started adding to the background after dry I was hoping you would not watercolor anymore. Yeahhhh….you did leave alone and the texture it left was GREAT!!! TY for the shading tip with watercolor pencils. I tend to have most things look muddy but now I know to go from light to dark. Love watching your videos. Again, thank you. Have a blessed day. OMG so cute. I especially love the Christmas pups! I may have to go shopping too! Darling! Now I gotta shop!